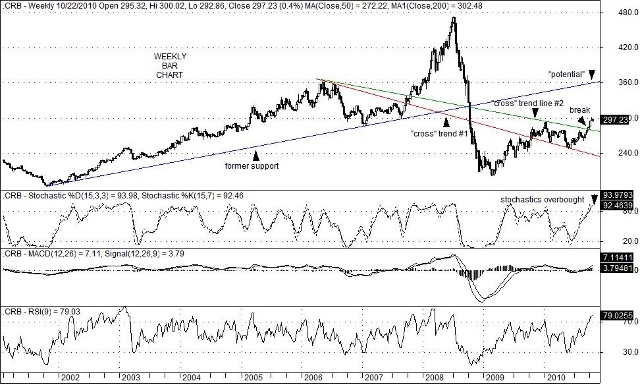 Despite overbought conditions on the weekly time frame, commodity prices as measured by Reuters/Jefferies CRB Total Return Index (CRB) have broken solidly above key trend line resistance at the 281 level and are in position to extend a lot higher. Clearly, a near zero percent Fed Funds interest rate policy, along with the expectation of another round of quantitative easing have played a big role in this breakout. Moreover, continued weakness in the U.S. Dollar Index (DXY) has been a factor as well. Although final demand inflation has not actually occurred, due to high unemployment levels and modest hourly wage gains, both commodity prices and asset values have been rising for months. Equity prices, typified by the S&P 500 Index, have risen nearly 77-1/2% from their March 6, 2009 low. Similarly, the CRB has risen nearly 48-1/2% from its March 2, 2009 low. While these are impressive gains, higher levels appear to be in the cards even if a period of post-election consolidation ensues next week. Part of the reason for further inflation and asset price gains is due to the Fed’s relatively aggressive money creation policy. Although austerity policies have been adopted by a number of European governments, the current US administration has not. This position puts the burden of economic stimulus on the shoulders of the Federal Reserve. As a result, equity prices should continue to grind higher with the profit picture improving. Over the foreseeable future, commodity prices should also find their way to higher levels since the dollar will likely follow the path of least resistance lower. This entry was posted on Monday, October 25th, 2010 at 1:18 pm	and is filed under CRB Total Return Index (CRB). You can follow any responses to this entry through the RSS 2.0 feed. You can leave a response, or trackback from your own site.